I had a request for some more straightforward impressions of Granada. So, now that the poetry is out of my system, here they are. This is the very end of my sojourn. It is maybe a good place to draw to a close. I arrived in Granada to a two day stay in a hostel not far from the cathedral and close to the popular Plaza Nueva and Calle Gran Vía de Colón. Just enough time to take a free walking tour, get my bearings and break down and buy a second pair of jeans. I had finally had enough of two skirts that were forever stretching out to being almost unwearable. I picked up the keys to the student apartment on a Sunday night and made my way into the Albaicín by bus in the dark. Albaicín is more than 1,000 years old. 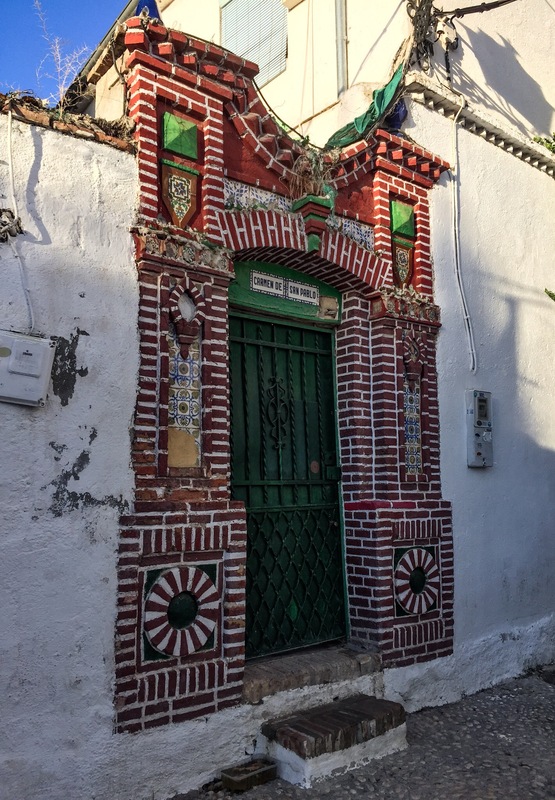 It is Granada’s old Muslim quarter built by the North African Arabs and Amazigh (Berber) people who conquered Andalusía. 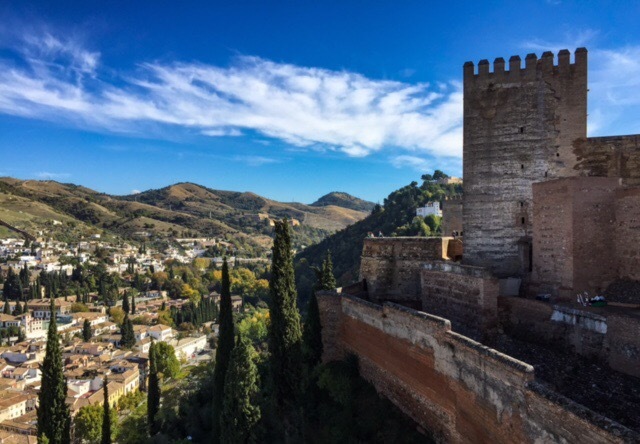 It climbs a mountain slope adjacent to the walled Alhambra – a breathtaking royal enclave and fortress. 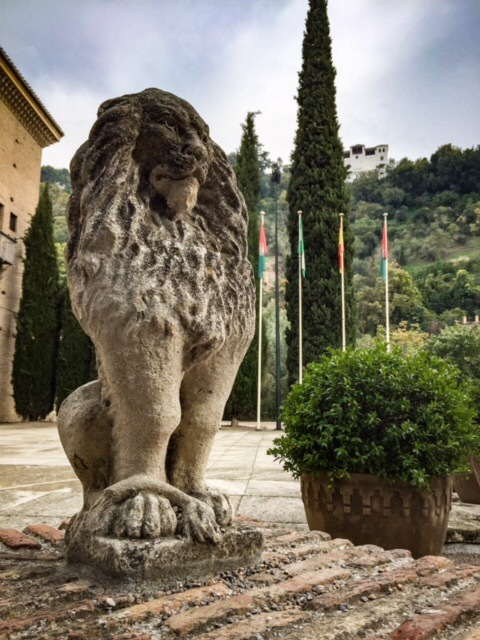 Together with the Generalife gardens and summer palace, the Alhambra and Albaicín were designated as a UNESCO World Heritage Site in 1984. 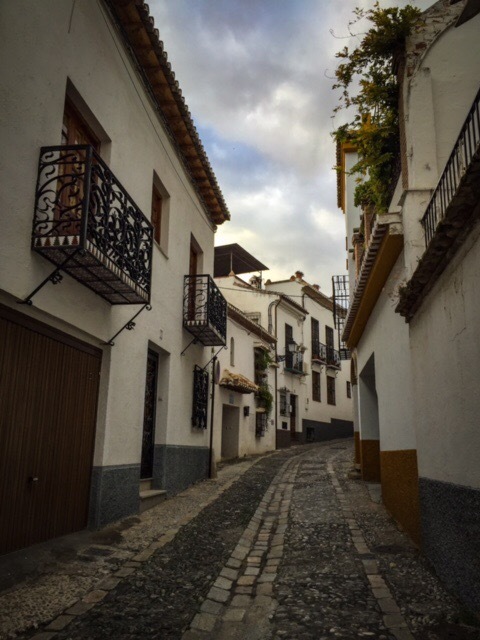 Albaicín today is a maze of winding cobbled streets overhung with vines and herbs and flowers from wrought iron balconies. Many homes are surrounded by a high wall with an inner terrace or courtyard where trees and fruit are grown for shade, fresh air and pleasure. These homes are called carmen. Most are painted white. 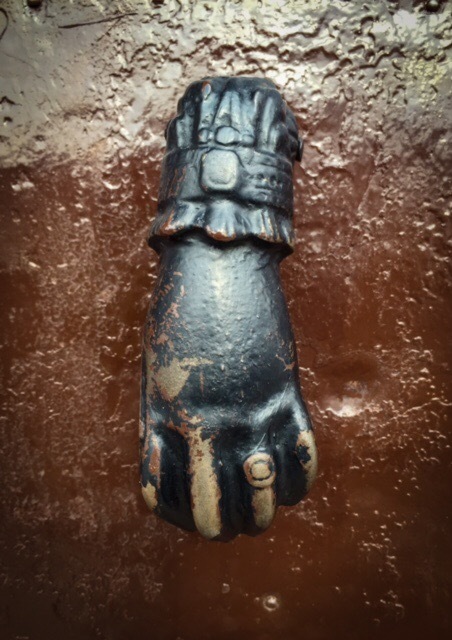 Many have unique names and elaborately designed doors or gates, each unique. 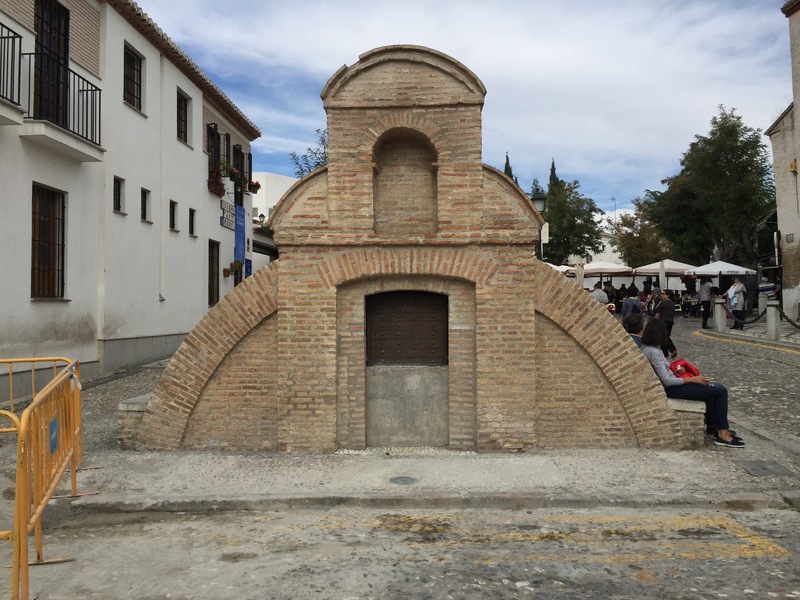 Throughout Albaicín there are also small brick structures with little doors. These are water wells. The Moors ensured that everyone had fresh drinking water not far from their homes. The wells are shuttered now but would have been a big part of community life hundreds of years ago. One of the larger community wells. Today, community life takes place in the plazas. Mostly small and intimate open spaces ringed with restaurants and cafes, shops and services. I’ve been told it is not typical here to invite just anyone to your home to socialise. The line between public and private space is more distinct with homes being the domain of family and only the closest of friends. So friends and acquaintances gather in the plazas and in restaurants spending hours over a single beer or a couple of coffees. There are always children, especially young children, in the plazas. There are also plenty of cats and dogs. Dogs are often given free run of the streets so you need to watch where you’re walking because they leave their refuse behind. But for the most part they are remarkably well behaved. It would be impossible not to socialise a dog in such a hive of activity. 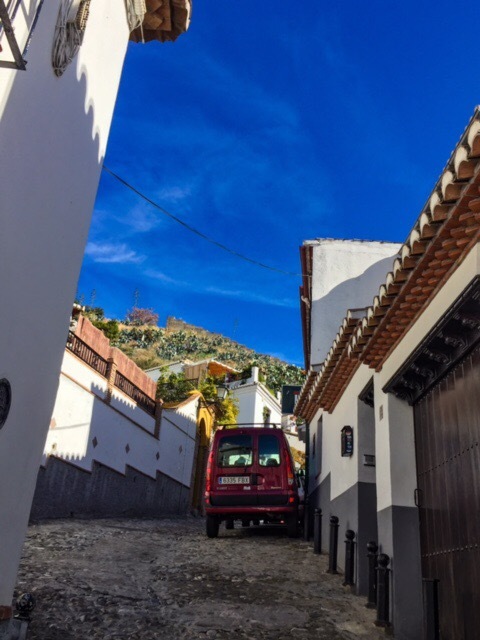 Albaicín feels like a pedestrian village but, in truth, any street wide enough to accommodate a vehicle – however tightly – does so. Motorcycles and mopeds are common and vehicles manage to navigate the tightest of spaces, often at significant speed. Off the main thoroughfares there are cobbled streets too small for cars and with too many stairs for bikes. At night I can sit on the rooftop terrace with other students, look out over the tiled rooftops and hear only the sound of footsteps and muted conversations in the streets below. It is remarkably quiet for a place so densely populated. 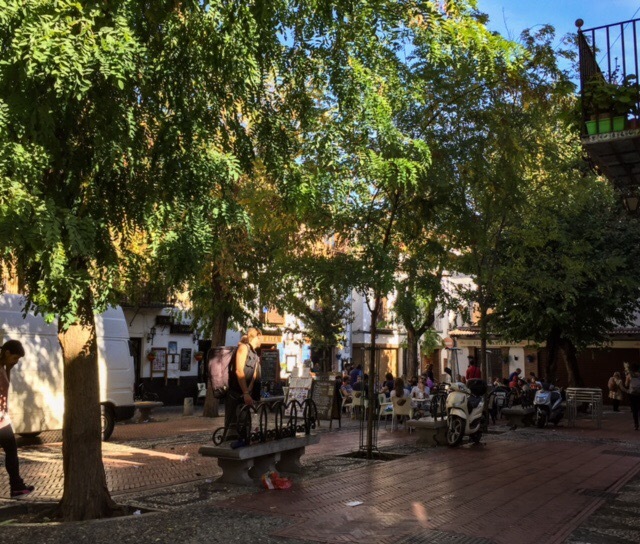 The student apartment is a two minute walk from Plaza Larga, one of the liveliest plazas in the Albaicín. This intimate plaza has everything you need within a 60 second radius – restaurants to stationers, a pharmacy, grocery store, hardware, and a fabulous Saturday market. Plaza Larga during siesta in a very quiet afternoon. Our apartment is not a charming carmen. But what it lacks in architectural character it makes up for in personality. It is a mini United Nations. In five apartments we have residents from Canada, the United States, India, Italy, Egypt, Malaysia, Switzerland, Russia, Japan, Sweden, Norway, Denmark, Australia, England, Israel and Palestine. Someone cooks a communal meal at least once a week. Most nights there is socialising somewhere over tea and cookies or beer and potato chips often with guitars. My favourite evenings are those spent in the kitchen, with pleasant company, visiting and listening to people jam, playing flamenco and blues. The apartment building is owned by the school we attend. It houses a mix of people and ages. All are studying Spanish, guitar, flamenco or a mixture of the three. 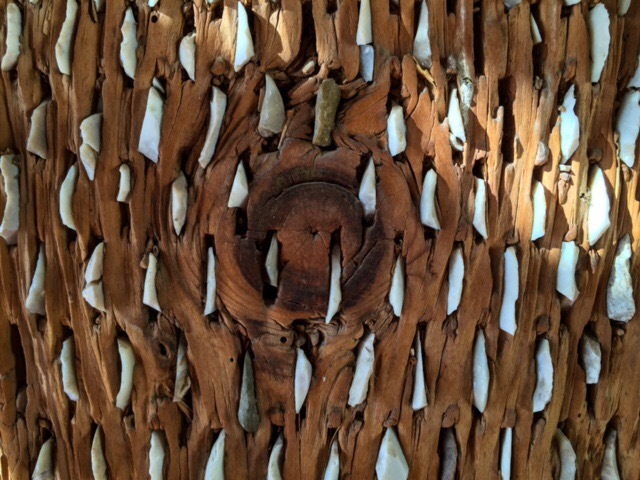 It is a community of artists and the artistically inclined. Some, like me, are here out of curiosity. Others have sold houses and left career paths, studies and communities behind to focus solely on their all consuming passion for whatever they pursue. Flamenco is a part of life here with so many students studying either guitar or dance. There is a tablau just 5 minutes from the apartment where, for 15 Euro, you can purchase a drink, eat a tapas, and watch a sweaty, fiery 90 minute concert. Flamenco is a complex and emotional combination of singing (cante), guitar (guitarra), dance (baile), and percussion (caja and palmas). It is full of joy and turmoil. I’ve been studying Spanish language, flamenco dance technique and flamenco compás (i.e. roughly, musical phrasing). The language classes have been encouraging but require concentrated effort that I’ve been sacrificing to spend time with people and places. The flamenco dance has been humbling. Combining the rhythmic feet with the counterpoint arms is challenging but in order to do either of those well you must also give it soul… posture and attitude are harder than movement. One if the mamy examples of public poetry. Flamenco compas is fascinating and fun. 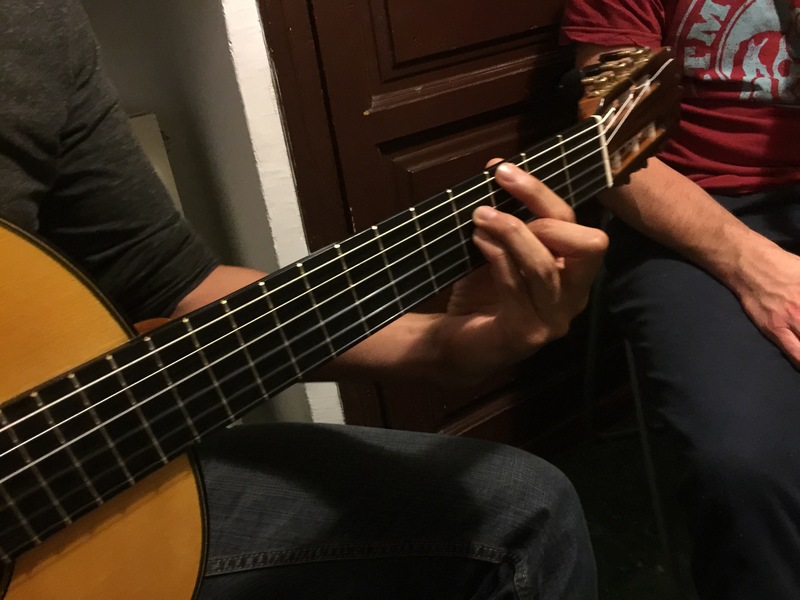 We started by learning the main flamenco families, each with a specific time signature. Within each time signature are various palos or styles, each with a different character. Some are happy, some serious, some sad, and all play with fours, threes and twelves. You must learn to tell the palos by the sound of the music and the rhythms alone. Then remember where the accents go – clap here, not there, foot stomp here, silence there. The rhythms can be counted, technically, but at some point you must give up counting and feel instead how all the pieces fit together. The hands are instruments and our instructor warned us frequently in lightspeed Spanish that it requires years to do it well. In general, the days are full. Classes start at 9:30 am and run until 4:30 pm with brief breaks. The evenings are filled with food and socialising and I am sorely lacking in sleep in spite of the siesta hours. It is normal for shops to shut between 1 pm and 6 pm. People without other obligations go home and eat lunch late, often after 3 pm, then work around the house or sleep for a couple of hours before getting up to work the second half of the day. Weekends are quiet until early in the afternoon. Streets are lively and fun, especially in the sunshine. Nightlife begins with dinner always after 7 pm, usually more like 9 pm, with entertainment starting between 10:30 and midnight. Last Saturday we went dancing and at 2:30 am half the crowd went home because they wanted an “early night”. The rest of us made it until 4:00 am then stopped for food on the way home, crawling into bed at dawn. Grape vines on the school terrace. 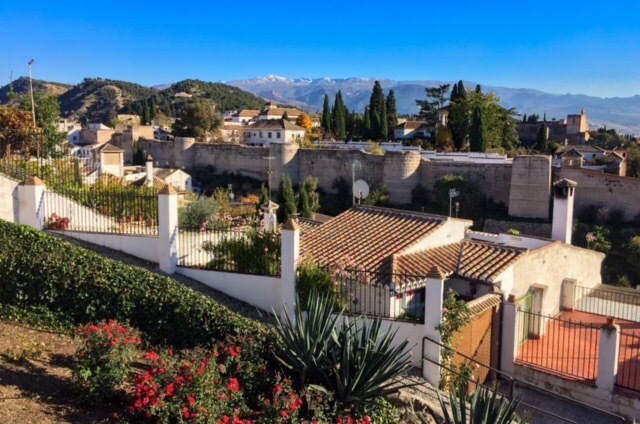 Outside of Albaicín, Granada is not a particularly large city but it is a modern, urban one with the requisite traffic and apartment blocks. It sits at the feet of the Sierra Nevada mountains in the region of Andalusía. There has been snow in the peaks already. You can hike from pine forests and snow down to palm trees and mangos in just a day if you know where to go, passing orange and almond groves, walnut and apple trees along the way. 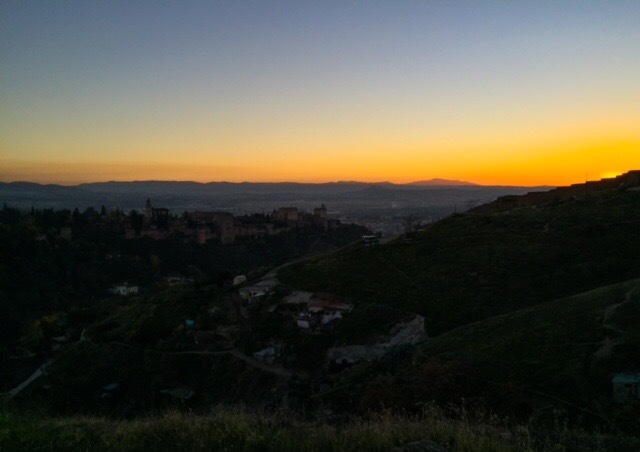 I can’t mention Granada without talking about Sacromonte. It is the traditional home of the Gitano (Romani or gypsy) people who brought flamenco to Spain. Starting in northern India and pulling cultural influences from Persian and Arab places along the way. It is famous for its cave homes, dug into the soft rock and takes its name from the Abbey of Sacromonte built on top of Roman catacombs. 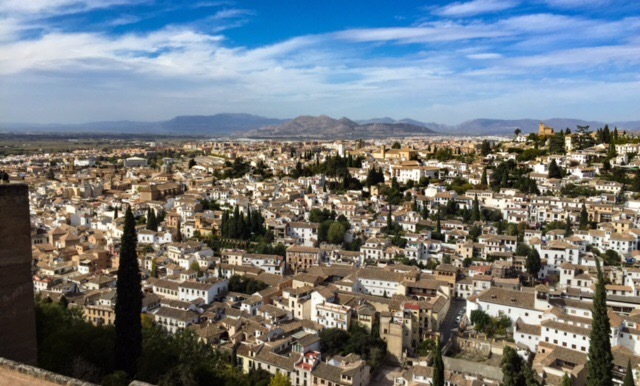 Today, it is home to Granada’s most Bohemian residents. Flamenco tablau coexist here with djembe and firesticks. I did not have a chance to explore it in detail this time. Maybe next time. People here seem to come back. Returning to Granada when they need a fix of the Albaicin’s village atmosphere and slightly intoxicating soul. It is a crossroads of cultures and histories and a mix of travellers and locals. I can understand why people return. Quartz stones embedded in a large door. For now though, I am leaving. Taking with me a full heart and a happy one. 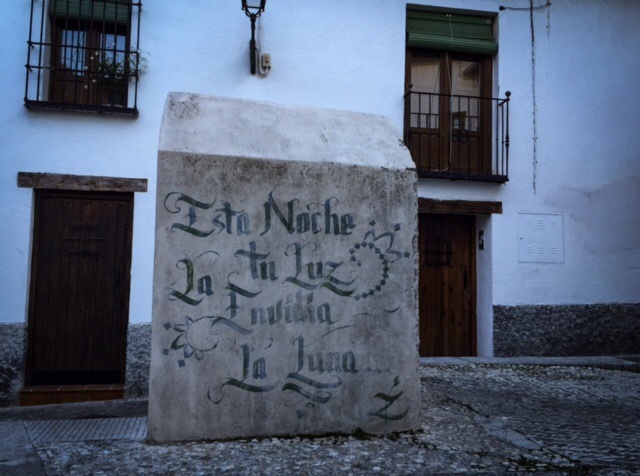 Yesterday we walked above Sacromonte to watch the sunset then returned to the house where neighbours made a feast. I packed while friends played music, sang songs and we finally all gathered for a big meal together laughing and stumbling through in Spanish and English. In the morning people began dropping by to say goodbye, bleary-eyed, bringing breakfast and leftovers. We drank Arabic coffee and shared mango and fried eggs and the ends of yesterday’s bread loaves. Someone told me at the beginning of the trip that I needed to “begin” my life. Pleading with me to stop searching, settle down, have a child, grow up. Maybe we grow up when we begin life a second time on our own terms. By all means, make a commitment to a partner, a mortgage, a community or a job – but above all we must make a commitment to ourselves. When we are able to say to ourselves, “I see you.” Without fear, disdain or frustration. Regardless of whether any of it is visible to others. When we accept what makes us who we are, believe it’s real, and live by it. Not like it’s easy or obvious. Just necessary. 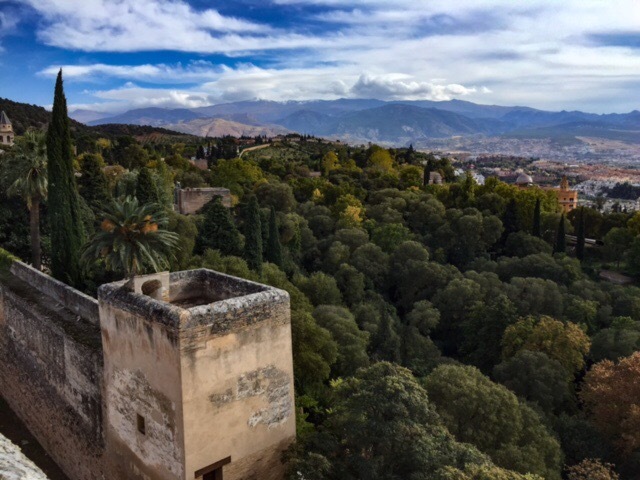 Looking toward the mountains from the Alhambra. So this one is for all the people who revealed to me their sketchbooks, drawings, dances and dreams, the project they were most proud of, the subject they were most excited by at school, the song they wrote, the business they want to begin, the battle they won with academia, the screenplay, the unrequited love, the relationship they left, the divorce they survived, the dignity they hold in spite of brutality, the home they hope to make, the book they are writing, the career they put on hold, the class they dropped, the job they didn’t take, the difference they want to make. You move me. I adore all of you for having accepted what is true and important to you. 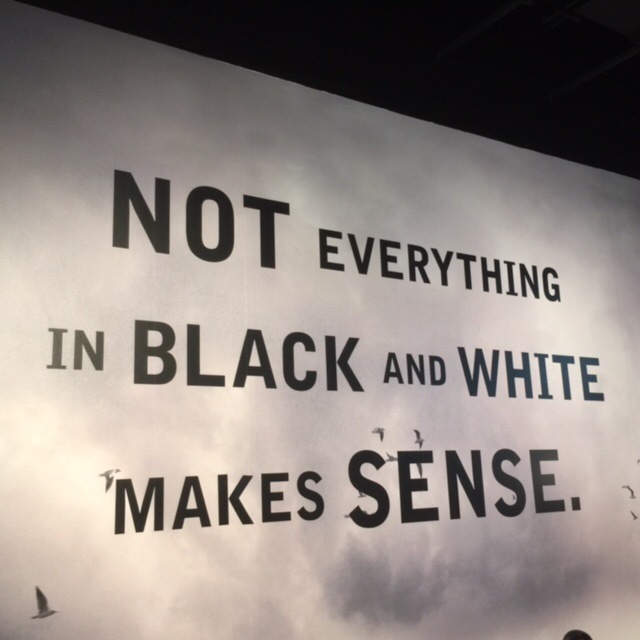 Even when it isn’t what everyone else is doing. Even when it’s not cool. Even when it brings you into conflict with people you love. Even when life makes it difficult. I have listened to people deciding what can and cannot be sacrificed. I have met people making their own luck with hard work fuelled by desire as much as discipline. I have watched people living today trusting the future will take care of itself. Life is mundane. This is part of the story. We aren’t all going to be artists and musicians. There are bills to pay and mouths to feed. But I hope to return with a renewed commitment to both the visible and invisible me. To make plans on my own terms. To begin my life. Albaicín and the Sierra Nevada mountains. 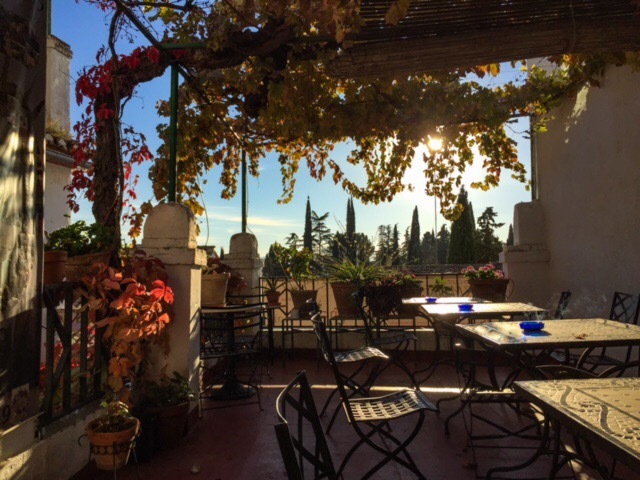 Granada, you keep me from writing. You wake me in the morning, feed me bread, olive oil and red tomatoes then send me into the streets of the Albaicín. A maze of wrought iron balconies draped in autumn foliage. Casually beautiful in the morning sun. You press your cobbled knuckles into the soles of my feet, white stones from one river, black stones from another. Blind me with sunshine on the white walls of the Carmen and arrest my eye with poetry. A stanza here. A line there. So many have loved you. 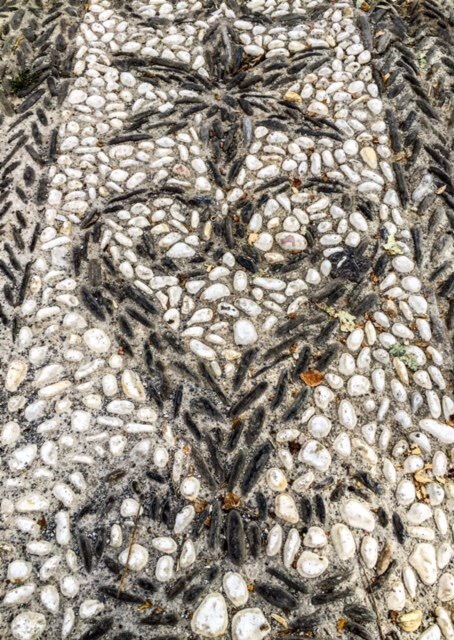 Street detail, Plaza de San Nicolas. Saturday, we women descend to Plaza Larga where the trees hang heavy over benches and tables, the market hive abuzz over eggplant and custard apples, tomatoes and onions. Vendors arrange their wares, leisurely lunches unfold over early drinks, tapas rush from busy kitchens. Piping papas fritas and boquerones suspended in their swimming. Above the animated murmer one foot pounds the floor in Bar Aixa. A brimming smile, brown apple cheeks and snapping palms declaring, Tango! A dog barks. Birds chatter. A ball thumps in the street between boys rushing for the next kick. A black cat with green eyes wanders langorously between our legs indifferent to our sentimental fingers. We pull apart bread and talk of marriages and children. We talk of dancing and decisions and float upon the peaceful distance of our other lives. Musicians busk for the crowd. One sings, the other pours himself over a guitar, cheek against the wood. There are bells chiming in the church. There are coins clattering on the table. Later. After graffiti and trompe d’oiel. After twice patched over plaster. Past abandoned caves smelling of urine and shuttered wells where generations pulled their daily water. We will wear absurdly synthetic running shoes and climb the dusty calle for sweeping views above Mirador de San Miguel. We clamber higher to where our feet slide over pebbles and the trees catch our hair and scrape our arms. Sitting on the edge we will watch the sun melt into the sky. We watch until the world is awash in indigo and orange, streetlights blinking on. The evening unveils her beauty and when we return to the Mirador, stopping to drink from the fountain, there will be lovers perched on the walls. The view from Mirador de San Miguel at night. 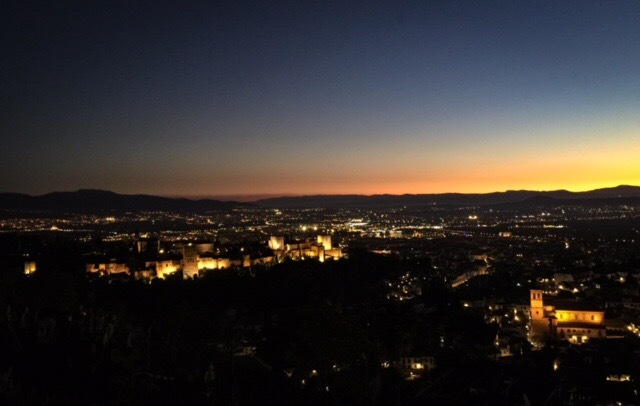 At night, Granada, you sing to me in Spanish, murmur in Arabic, and whisper in French, quoting Allen Ginsberg. In the sound of my footsteps I hear tangos and bulerias. In my belly is the sound of many hands clapping contratiempo, a tiempo. Red lips and shiny nails, the clack of heels, a dance that pulls down into the gut and opens through the heart. You pierce me with wild blue eyes and caress me with gentle green. I hear music when I stir the soup. Bitter burning cigarettes and marijuana, cerveza and the ever present Alhambra still looking, still watching, still present and past. Africa is on the wind. The sea is in the air. Mountains flaunt their showy, snowy peaks and flirt with the autumn sky. You are tenderness and Chinese ink. You are rebellion in drop D.
Near Cuesta de Alhacaba in the Albaicín. 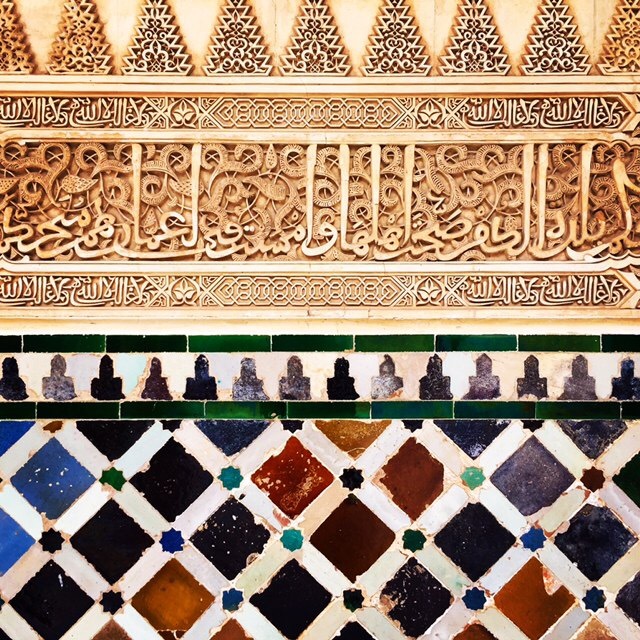 In the Alhambra. 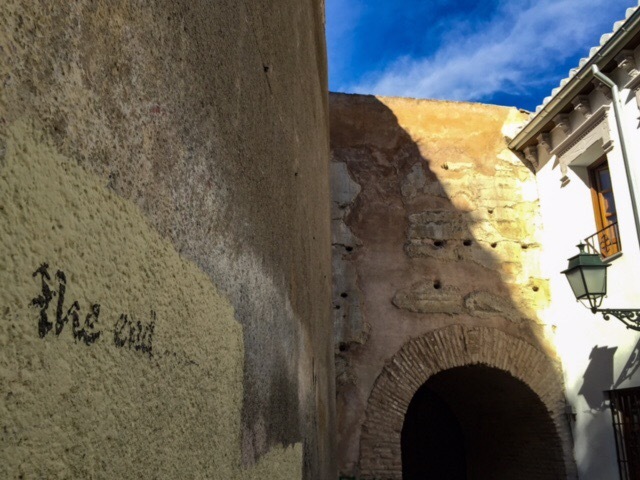 Granada’s art-laden, walled city within a city. 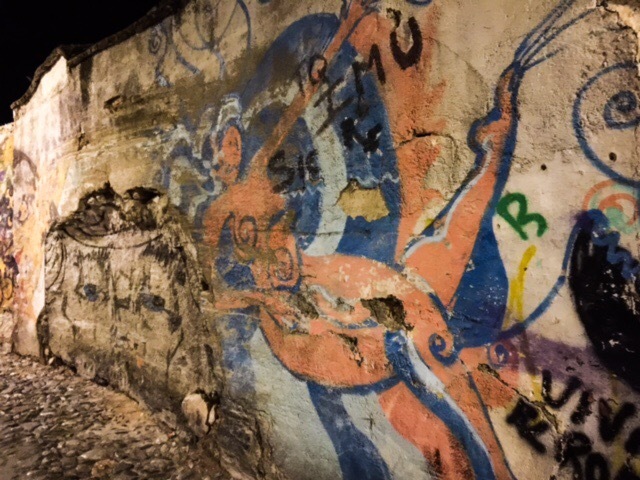 “Granada,” the sinewy Argentinian woman says to me, “Está un poco mágica. Pero te golpea también.” This is a place of becoming and forgetfulness. You tell stories like Scheherazade and we diaspora keep listening, licking our fingers, waking thirsty and cotton-headed, then rejoicing in another day. Granada, you steal my hours and my days and give them back to me stuffed with all things fleeting and beautiful. You give us back to our throbbing, heartfelt selves and each encounter makes us wish for it to last. 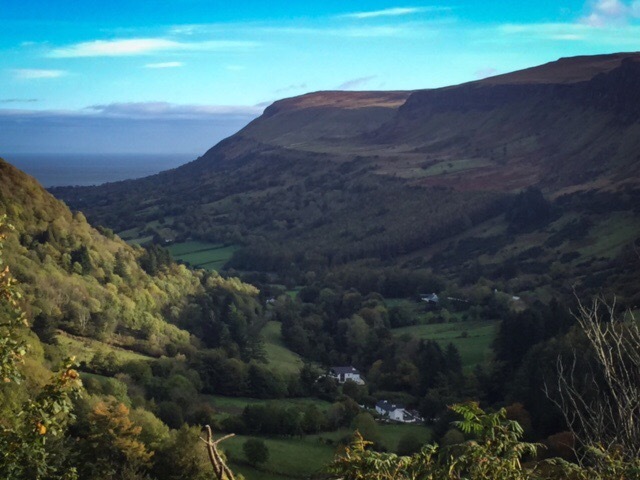 Glenariff – Queen of the Glens in Northern Ireland. Today is my last full day in Northern Ireland before the long journey south. I have to bid farewell to day after day of warmth, interest and good humour from complete strangers. 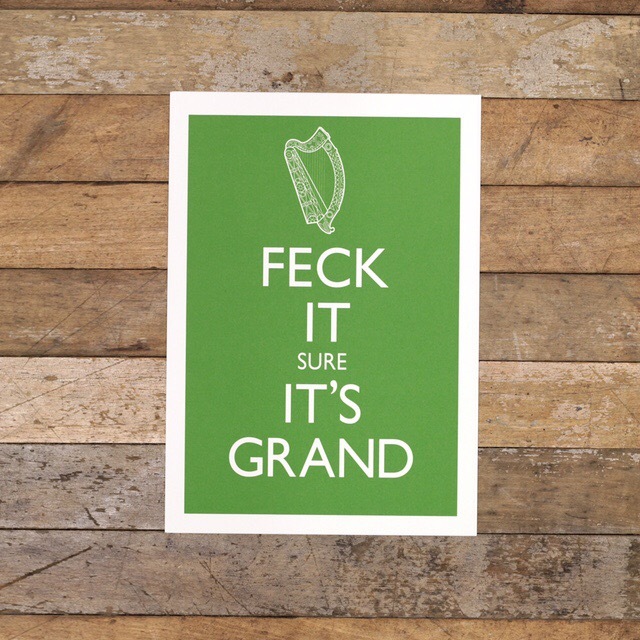 Great “craic” as they would say. I’ve spent the past five days on the Antrim Coast visiting geological wonders, picturesque harbours, groves of ancient trees, ruined churches, museums, forest parks, seaviews and music filled pubs. I even had a banjo lesson! All the while gathering confidence on the narrow, shoulderless roads winding through tiny villages and up and down Northern Ireland’s famous glens. 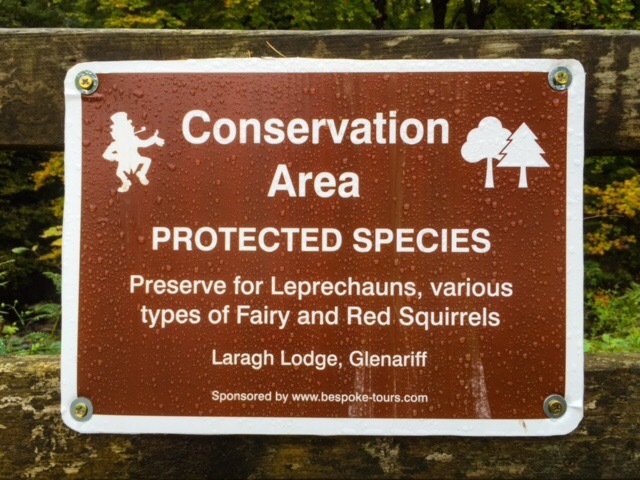 A sign at Glenariff Forest Park at the head of the glen. Yesterday night there was a sharp knock on the door. It was one of my hosts. Well, yeah! I put on my jacket and squeeze into my shoes. “You’ll need this to sit on.” He grabs a lavender toss cushion from the couch. I don’t think the Mrs. would be keen to see her lavender toss cushion on the back of a quad bike but he sets it down and I jump on. Fly is beside herself with joy. And off we go. My hosts have been married for 14 years and have two small children. They raise sheep and cattle on land that was left to them when his father passed on. It’s been in the family for generations and runs in a thick stripe from the pastoral valley up the side of the glen to where cliffs climb for the sky. They graze sheep in the valley bottom and cattle on the sloping pastures above. 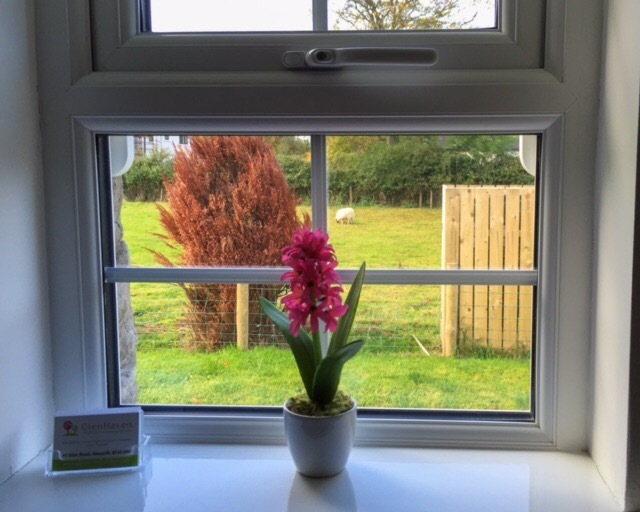 The holiday cottage, built in the middle of a sheep pasture, has several rooms. It supplements their income and thanks to Air B&B, the paperwork is minimal. This means they can farm less intensively, which is better for the land, and share with guests what they feel is a slice of the “real” Ireland. “We’ll go see the tupps first,” he says while we rocket down the lane. The two rams were conditioned slowly to live together in testosteronial peace. One wooly and round. The other hardy and endowed with an impressive set of spiral horns. I ask a lot of questions and learn that they will soon be set out with the sheep and will have ~65 days – or three 21 day sheep cycles – to make new lambs. Lambing usually begins on the 1st of April and lasts three to six weeks. It’s a happy time of the year but also stressful. The sheep have to be monitored for complications and if that means staying up all night, so be it. Of course, this would be easier if my host – like most farmers here – did not also have a full time day job. He works as a joiner and manages the farm after hours and on the weekends. His wife tells me that he loves touring people around. It’s not work for him, even though it is well past 7 p.m. and I’m sure he hasn’t yet had dinner. We pass through a couple of gates and stop by an inviting green pathway that skirts the sheep pastures and dry stone walls on either side. The Ulster Way climbs high above the glen and stretches into this wild landscape. The local economy could use the lift. For most of the 20th century the nearby villages of Cushendun, Cushendall, Waterfoot and Glenariff were popular seaside destinations. But the tides have turned and most modern tourists now set their sights on the Giant’s Causeway – a geological marvel recognized by UNESCO on the North Antrim Coast. It’s a pity really because the nine glens have lost none of their beauty. Back on the quad, we bump along a grassy track. It smells of sea and grass. Fly runs along in front, barely staying out from under the wheels. She is anxious to please; awaiting her next command while nosing fence posts and navigating over the deeper mud puddles. We bump out on the road then veer off again up a laneway and through another gate into the long stripe that climbs the mountainside. This is the cattle pasture. The cows see us coming and make short work of closing the distance. “You see this?” My host nods toward a hardy shrub about my height with wicked-looking spines. And with them, the bees and other insects, followed by birds and bats. A trophic cascade. The dark green areas are no longer actively farmed and gorse begins to take over. This land has been grazed for 1000 years or more. So the ecology is inseparable from the people and livestock who live here. But intensive modern farming practices reduce biodiversity. So my hosts have been experimenting with using less fertilizer and spray. They’ve noticed more bats and suspect that more birds and butterflies will follow. To help things along they have placed swallow nesting boxes and red squirrel feeders around the property with help from local conservation groups. A pheasant feeder is tucked up against a drystone wall. The dry stone wall that supports the feeder is also part of the plan. He tells me he builds 10 or 20 metres each year with help from a local teenager. 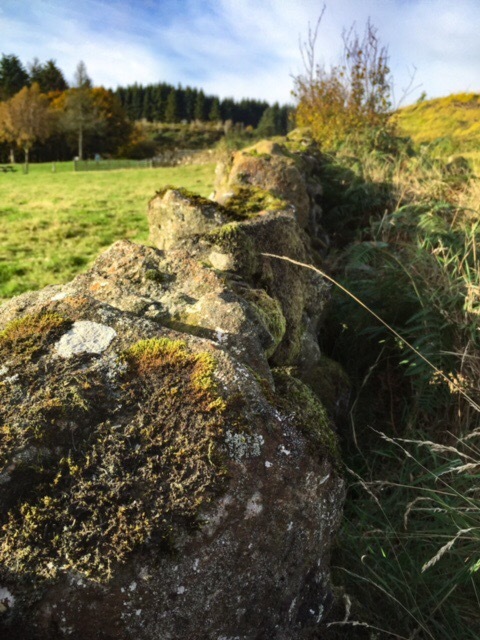 The picturesque walls provide shelter and nesting spots for birds and small mammals. As the barbed wire is slowing being replaced with traditional dry stone, small animals are returning to the farm. A dry stone wall at the top of the glen. I hold on for dear life as we rock and bump up the slope. The cattle are following us, mooing loudly in protest. But they are determined. My host explains that these are Dexter cattle, smaller than other breeds but hardy. They are particularly suited to this land because they eat scrubby grasses and shrubs that other cattle won’t. This keeps the scrub back without grinding the grasses into mud. 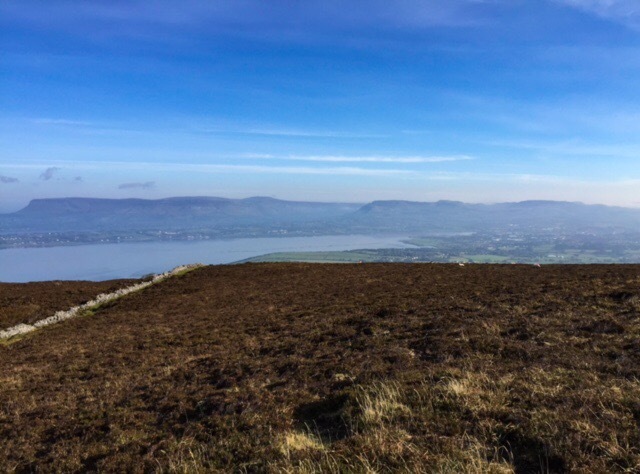 At the top of pasture, we look back over the green and misty villages of Waterfoot and Glenariff and the crescent shaped beach on Red Bay. The harbour is steely grey now in the almost darkness. The glen and the ocean are vast and and I remark on their beauty. Farming is definitely not stress free, but people in the area take pleasure in their life here. He feeds the impatient cattle who jostle him while jockeying for a better position. We leave the mountain and head downhill to an old rail line that cuts across the property, following it for a distance past an abandoned chicken coop. Up again we climb and then wade through tall grasses to an old stone ruin in the trees. I’m glad that local people find these places interesting too. With some research he hopes to find out exactly who lived here and when. The tiny windows and remote location tell a story of poverty. Apparently people paid rent, in part, by the amount of daylight in their homes. The bigger the windows, the more rent was due. So small doors and windows kept the costs down. An abandoned stone cottage. Large and well off compared with the one above the Glenariff farm. By now, it’s very dark and I’m glad for the headlight on the quad. We tumble back down to the valley and my host deposits me at the doorstep. He promises to come back the next day to take me up to the top of the glen and rumbles back into the night and home. Air B&B was pretty much the best decision ever in Ireland. The spin around the farm cements some of the things I’ve been learning in museums around the way. 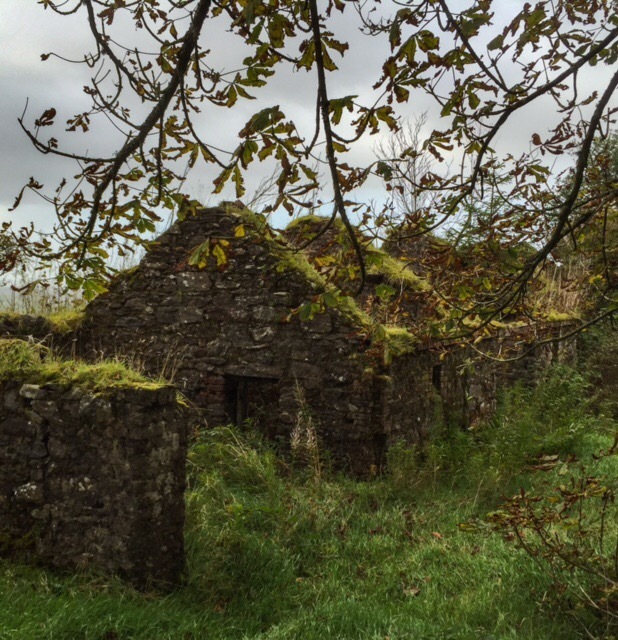 This entire glen was once divided up into townlands, each providing land and resources for a community of people. Aside from travelling down the valley for church, most people lived and died entirely within the boundaries of their own township. The farming that takes place here today is part of a very long tradition. I wonder what the earliest residents would have thought of people here playing host to the world. For them, this life was mundane. For me, it is an adventure. But isn’t that the joy of travel? This is a surf beach. The parking lot is filling as the swells get larger. 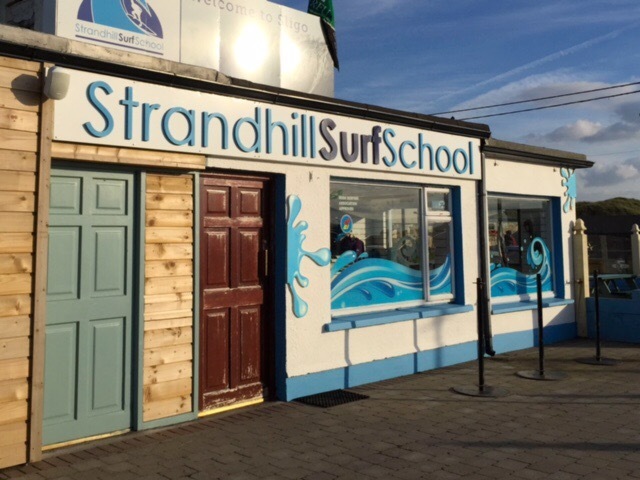 There’s a van in the lot with wetsuits hanging off the roof rack and a surf school across the street. The sea air is fresh and unseasonably warm for late October. Beautiful people with suntans walk around in toques, sandals and hoodies. It reminds me of home. Skiing and surfing are sort of cousins, aren’t they? Mammy Johnston’s is on a bright corner and Mister Mister is on the radio. Bleached blonde wood floors and distressed panelling make sense here next to the beach. There’s a wall of candy, a sinful collection of baked goods, coffee and an ice cream counter that bring a steady stream of people into the shop. 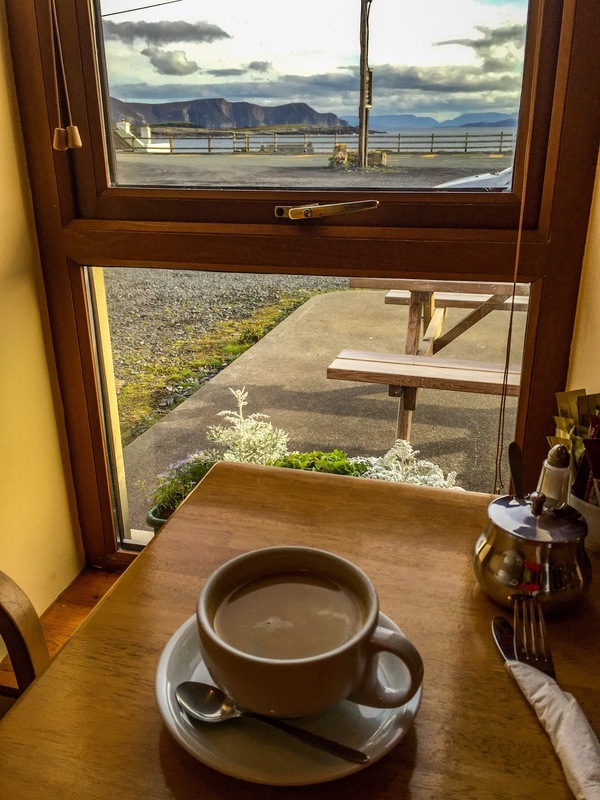 The promenade outside has a breathtaking view of the Atlantic Ocean but really, around the West Coast of Ireland you don’t have to go far for that. 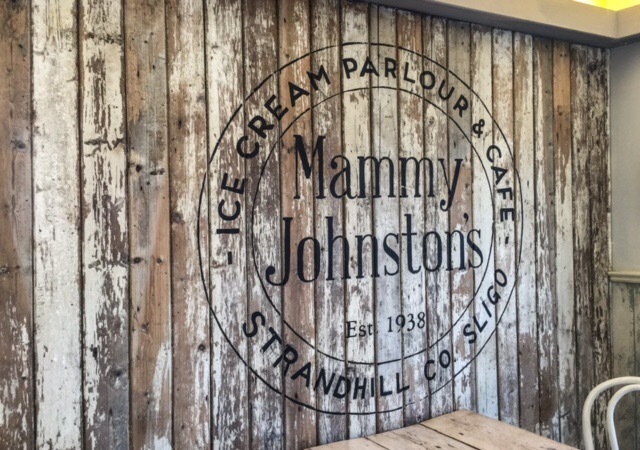 Inside Mammy Johnston’s established 1938. I spent this morning on Knocknarea, a low mountain between Strandhill and Sligo with a 6000 year history wrapped around its summit. The enormous cairn on top is one of several passage tombs. The largest one is know as Queen Maeve’s Grave (Miosgan Meadhbha). This is one of three possible gravesites for the ancient warrior queen. Legend has it she was buried standing up facing the land of her enemies with a spear at her side. 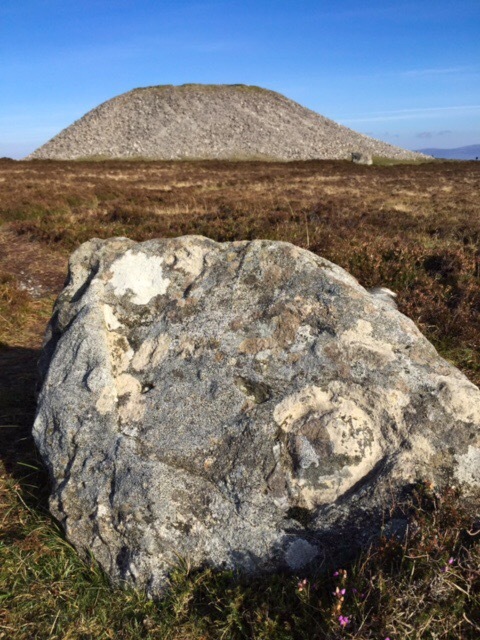 A large stone, part of a passage tomb, with Queen Maeve’s Cairn behind. The view from the top is definitely commanding. Three hundred and sixty degrees of sea and mountains. You can see why ancient people would gather here. There are cairns on the tops of many of the mountains on the horizon, barely visible in October sea haze. The Carrowmore Megalithic Cemetery, equal to Newgrange in importance, is just a couple of kilometres from here. This is an entire neolithic landscape. “Samhain,” a woman says to her friend as they walk by. “When the veil is at its thinnest…” he replies. They wander off and I’m left alone staring up at the huge cairn. What did people do up here? What gods did they appeal to? What rituals were performed? I try to picture hundreds of people gathered on these flat, heathered meadows high above the bay. At this age back then I would have been nearing the end of my life. I’d be walking across this revered landscape with my grown daughter and her daugher besides. A whole life already lived. Hardships faced. Joys celebrated. Funerals. Births. Marriages. Wars. I walk around the cairn and think about the women in my own family who had little chance to indulge their personal curiosity. My grandmothers, one who gave up nursing to care for her siblings and another who raised a family for a time in a sod house. My aunt who died before I was old enough to know her. My great-grandmothers whose crushing work started at sun-up and continued after sundown. What kind of lottery of good fortune did I win? I like to imagine these women living vicariously, peering over my shoulder. Sharing their opinions with one another of Queen Maeve. Unusual for her time not for her five husbands and thirteen children but for being wealthy, powerful and having well-established criteria for her mates – not fearful, not mean, and not jealous. Yes. It would. But then I wouldn’t be having this converation. On the one hand I’m touched that he cares. Concerned about me being out here alone. And then I think of Queen Maeve and how almost everything I’ve heard about her has to do with her search for a mate. I marvel at how two thousand years later being alone or not alone is still “a thing” for women. I’m not annoyed. Just kind of dazzled. It makes me feel a little closer to my neolithic ancestors. It might be the only thing Queen Maeve and I have in common. 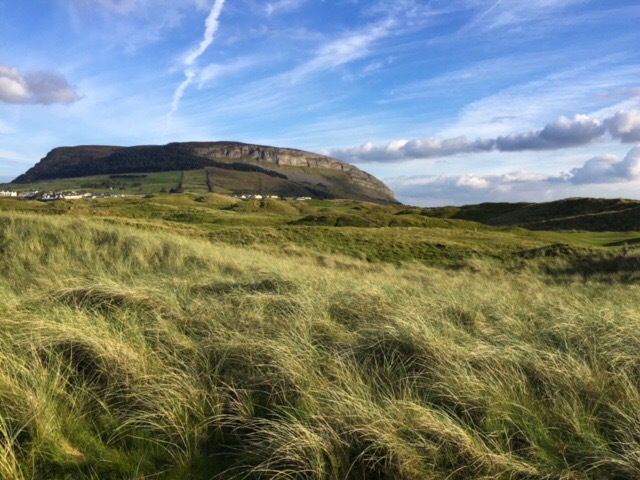 After my walk on Knocknarea I whiz down tiny laneways overhung with trees into the fresh and breezy village of Strandhill. 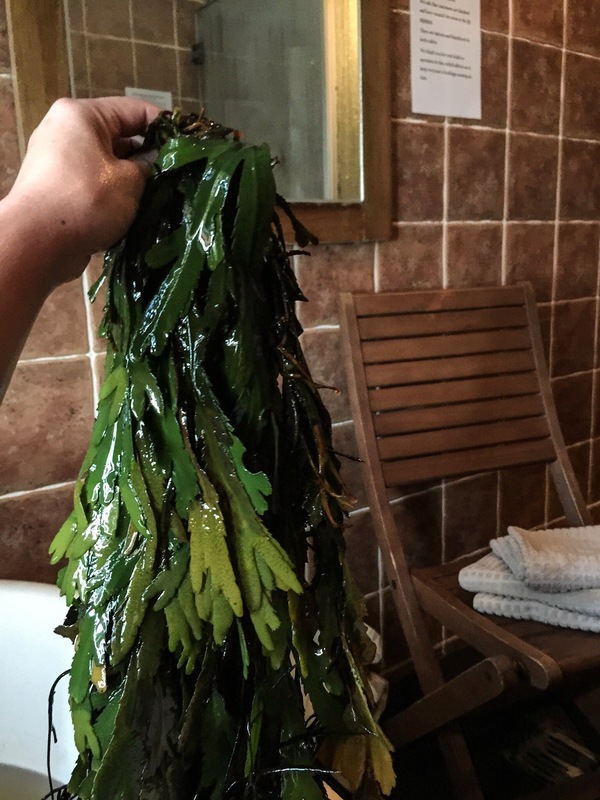 My colleague has recommended a stop at a spa offering seaweed baths. A cultural experience, I’m told. Not to be missed. The sound of the sea floods the lobby and I’m given a robe, flip flops and a bag for my clothes. Then am led into a room with a steam shower, a folding wooden chair with white towls stacked on it, and a large clawfoot tub under an open window with a jug of water and a glass on the sill. Steam showers are heavenly (and, I might add, environmentally sensible because you can turn the tap off while you’re washing your hair and not freeze your arse). I’m warmer than I’ve been since I left Morocco and feeling pretty awesome. At which point it is time for the bath. 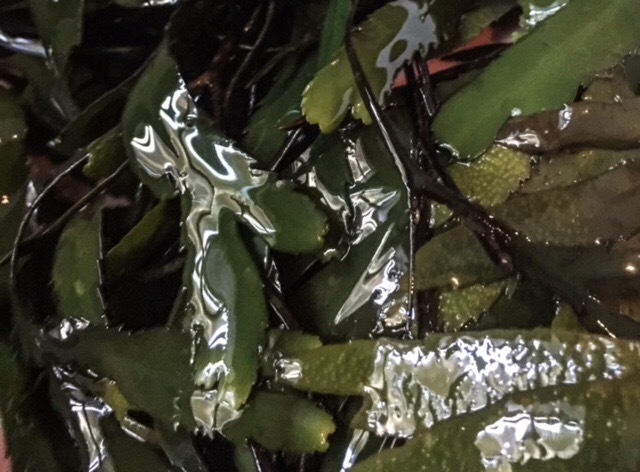 But into the hot, hot water I went… engulfed by green leaves and a thousand, delicate jelly fingers. Oh. my. god. I think of Sedna. I feel like a sea goddess. This is about ten thousand times better than bubbles. It’s not like bathing in the sea it’s like becoming the sea. When I depart I walk along the beach in the bright white northern light and watch the surfers in the break. Runnels form in the sand where water runs out of some hidden stream behind the grassy dunes. Dogs play. Kids write their names in the beach. Which brings me back here, to Mammy Johston’s and peppermint tea. It’s the end of the day and I’m staring down another evening. Too early for music and too late for just hanging around. On the bright side, I might actually finish this blog post before the day is out. 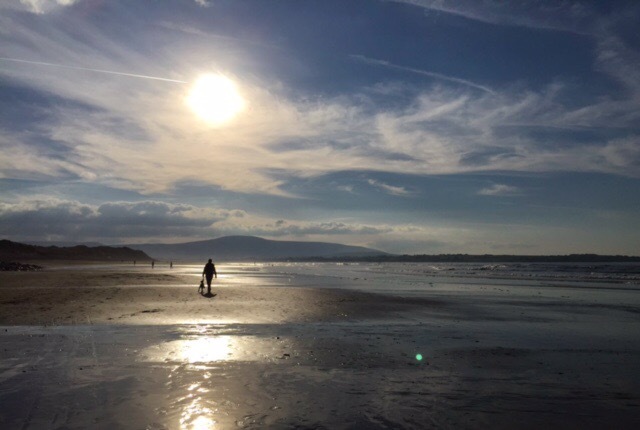 At the halfway point of the trip I scheduled a week in one place – Bertra Strand – a long finger of pebbly dune reaching out into placid Clew Bay. When I got here all I wanted to do was wander, eat and sleep. Enjoying the blessed silence of a finally peaceful mind. So after a pounding overnight rainstorm I spend the day doing laundry, groceries and “strategizing” for the week. Which basically entailed deciding what to cook, making a list of fun things to do, and creating a playlist of pop songs I kept hearing on the radio because I knew they would remind me of here. 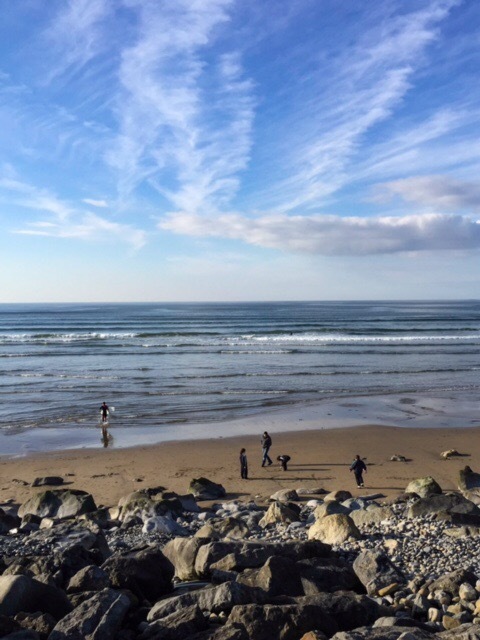 Westport was not long ago voted the best town to live in Ireland. It sits at the end of Clew Bay, supposedly with an island for every day of the year. The islands, they say, look a bit like apples bobbing in the sea. 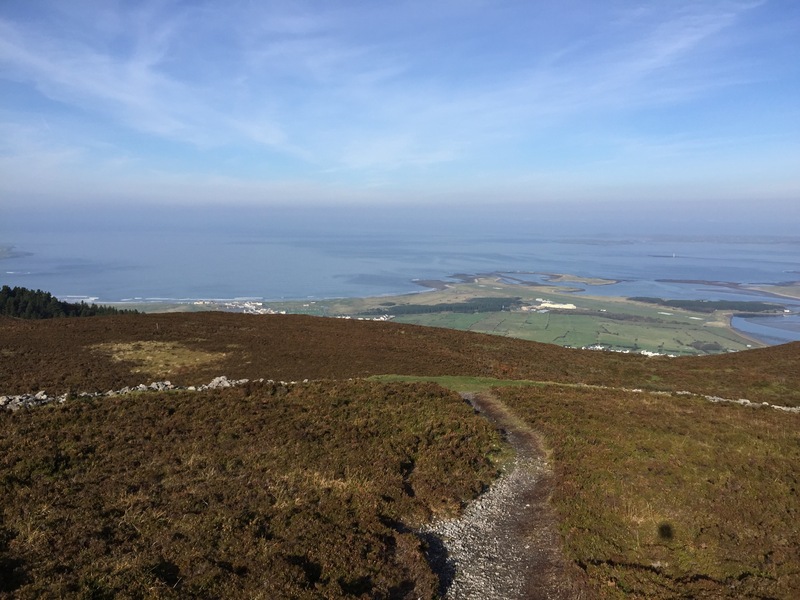 Berta Strand and Clew Bay from the top of Croagh Patrick. Westport is off to the right at the end of the bay. The region is home to some very ancient sites including the beautifully carved Boheh Stone – on par with its cousins at Newgrange. The stone marks the point at which the setting sun appears to “roll down” the side of Croagh Patrick. It follows the edge of the famous peak’s silhouette twice each year. 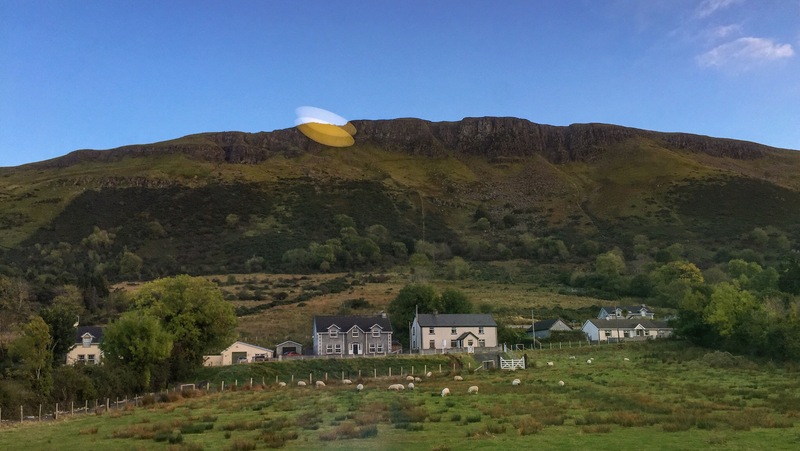 This is the mountain Saint Patrick chose to retreat to – praying for 40 days on its peak. It is Ireland’s most sacred mountain and every year, on the last Sunday in July, thousands of Christian pilgrims make their way to the top, some in bare feet. I wait for the sunniest day of the week and make the journey in the afternoon (with shoes). It’s a climb of about 2.7 km and 860 metres. I stop at the saddle for a couple of photos. I take the kind woman up on it. We get to talking and I learn that she and her husband are walking around Ireland. They’ve walked around the ring of Kerry, took a bus here and are now walking around County Mayo. They are in their 60s and I discover we are from the same part of the world. In fact the same community… the same neighbourhood. They live ten minutes from house I grew up in! We laugh at the coincidence, I take their photo for them, and we and go our separate ways. Nearing the summit I meet Alicia from the U.S. who spent weeks on the Appalachian Trail and never wanted it to end. 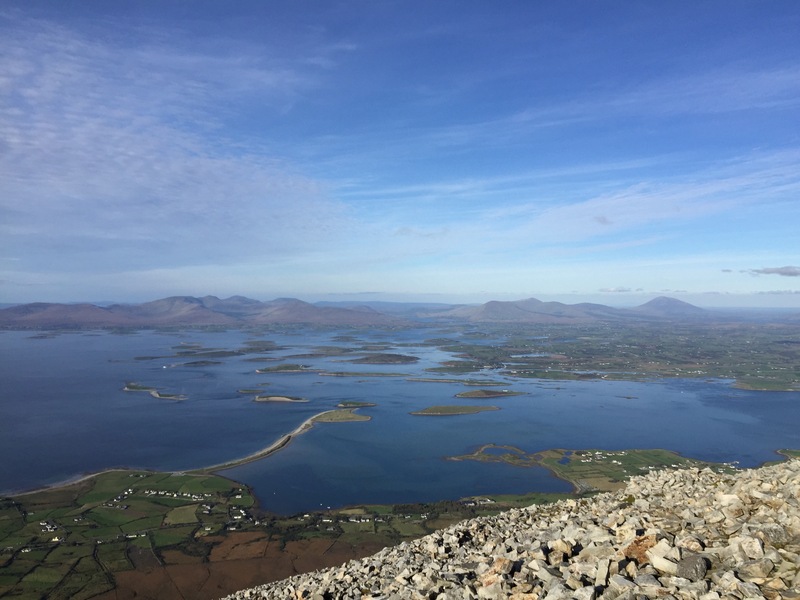 We climb the last third of Croagh Patrick, a steep and sporty scramble through loose scree, and enjoy the view together at the top. Green-blue islands in the blue-green sea. Hazy mountains rim the bay and a church marks the spot where St. Patrick prayed. Masses are still offered here. We sit down and each have a well earned cookie. I take a second and try to give her the last two, half to save my own waistline and partly because she says, “Mmm!” and asks to see the brand. She takes a second cookie but refuses the package. “No really. I’d like you to have the last one,” I say. But she tells me she will buy a package of her own. This is something I would do, declining a gift because it feels like charity. But after a week of easy conversation with strangers the desire for independence feels more like a sort of well-disguised fear than a strength. It’s a trade-off. 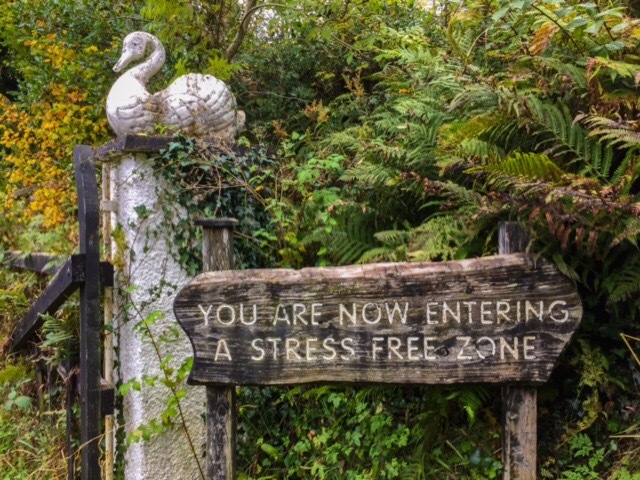 Security in place of the uncomfortable vulnerability of gratitude and connection. I put the cookie back in my bag and before I’ve taken my last photo at the summit she is already well on her way down the mountain. I pick my way down, leap frogging with an Irish man who hikes to the top of Croagh Patrick whenever his job brings him to Westport. He asks me why I took three months of work and I ask him about his work and family. In the past year he has sold his business and amicably divorced after twenty-five years of marriage. He left his wife with everything. The house, the savings and the proceeds from the business. He is starting from scratch but is effervescent and optimistic and I’ll admit, I’m not sure whether he is quite naïve or sagely wise. I don’t think he knows either. But he is at peace with himself and his family and that is enough. Back in the quiet parking lot we go our separate ways and I stop to visit the outdoor chapel. There are candles here sheltered from the wind. The Virgin Mary was once said to have appeared to a group of children near here. Her statue now stands in the growing dimness of the evening, perfectly aligned with the peak behind her. Arms outstretched, beseeching visitors to “come back to my Son”. I sat for a few minutes in the cool evening air, watched the sunset and returned to the car, tired and content. 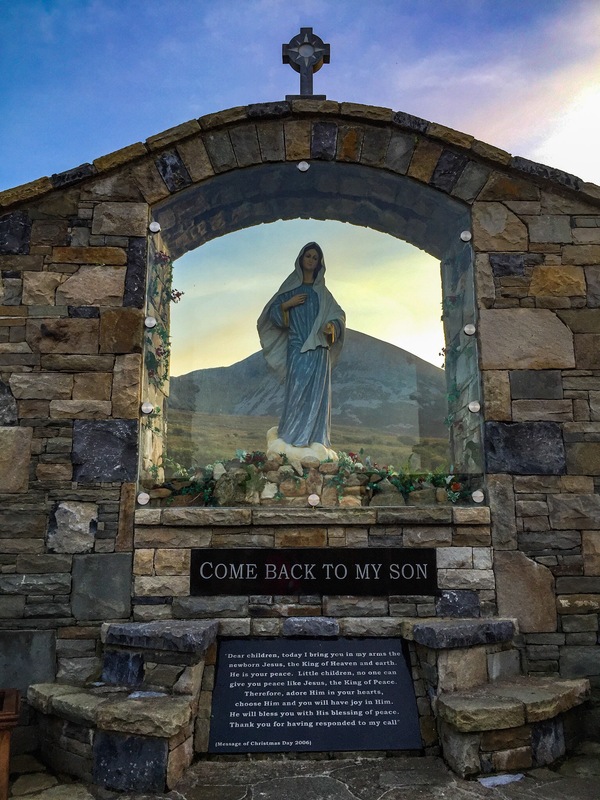 The statue of the Virgin Mary at the base of Croagh Patrick. Sea birds careen from electric pole to electric pole. Far off, a cliff gazes west across the bay. 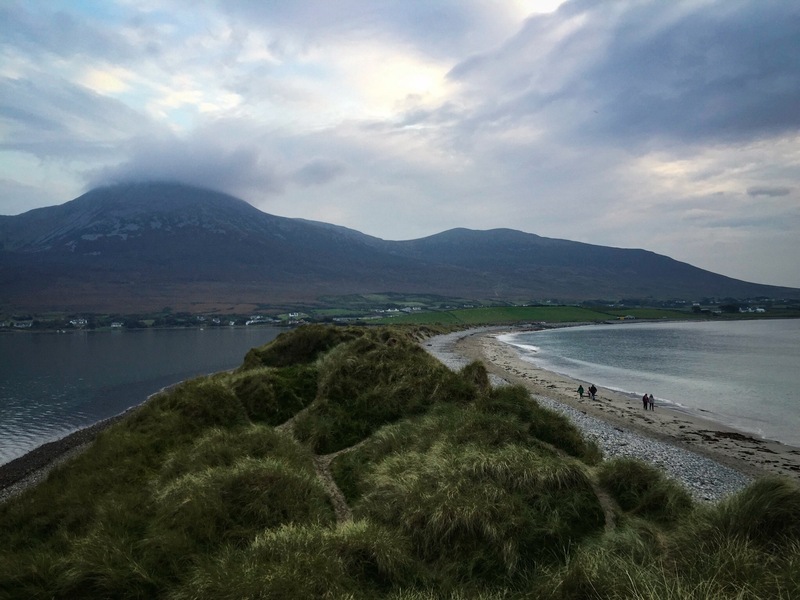 I’m in a tiny village called Dooagh near a famous beach called Keem Strand on Achill Island – one of the furthest points west in western Ireland. It’s been difficult to write since leaving Dublin. The days are long and the driving is intense. I’ve never seen a laneway with grass growing up the middle marked with a speed limit, let alone one of 80 km / hour. No joke, folks. The Irish drive their little four-doors like rally cars and do it well. I’ve also been torn about describing the extraordinary beauty and history of this small but “big” island because I keep meeting people who are such fabulous characters they deserve more than just a passing mention. Vince from Charlie Byrnes bookstore in Galway. Sean from the gift shop up the road. Karol, the most lovely host at an Air B&B in Salthill with whom I share a career path and a birthday. The self-named Faerie Moonbeam and her bemused first date. The other Sean from O’Connor’s pub whose father works in Calgary. Julianne from The Burren who taught school in Edmonton for 30 years. Martin from the Ryan Air flight who I sadly lost track of in immigration before being able to say goodbye. There are. So. Many. Just now, I took a 20 minute break to talk to the woman behind the cafe counter who is an accountant with thoughts of going to America. She has friends who moved to Toronto and are struggling to find work in the current economic climate there. It’s the same in Ireland. Rents are high. Work is scarce. She isn’t sure she should go but, growing up in Achill, she knows there’s a bigger world out there. 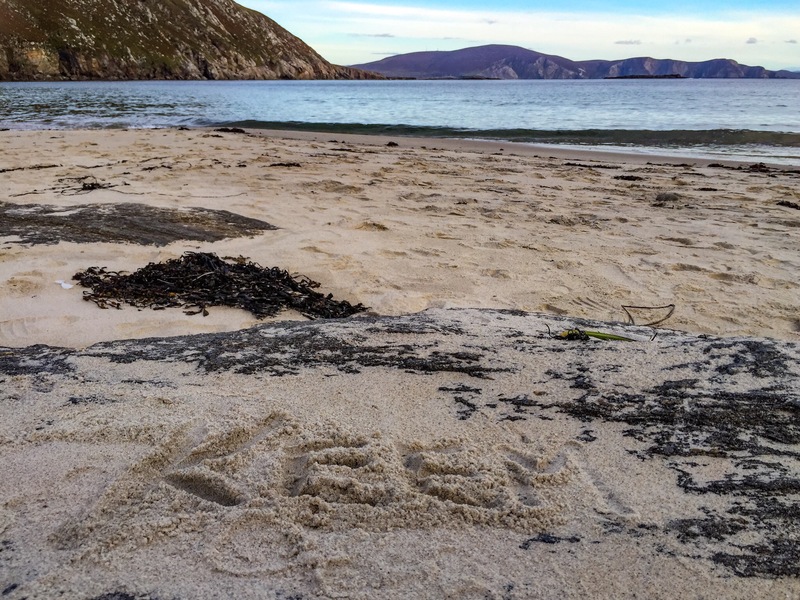 And here I am in Achill… looking for the same thing. Americano and a view at Gielty’s Coffee Shop. She went to the back to prepare a meal for the proprietor emeritus of this fine establishment. A man named Michael who gave me good advice on where to go next on my trip around the island. He was born in 1933 just around the corner and his son now runs the place. He squeezes a smile around bright blue eyes and tells me I am doing the right thing by talking to people. It’s the best part. We learn a bit about each other. He tells me many of his family moved to America. Everyone here seems to have a connection. He gives me some pointers on where to go next. “Go up from here to Keem. You’ll spend an hour there I’m sure. It’s lovely. When you come back, take a left and go to the Deserted Village like. Then watch for signs to Doogart and do a loop. Go up to Minaun Heights, then turn right and go round the Atlantic Way for those views there. It’s beautiful. 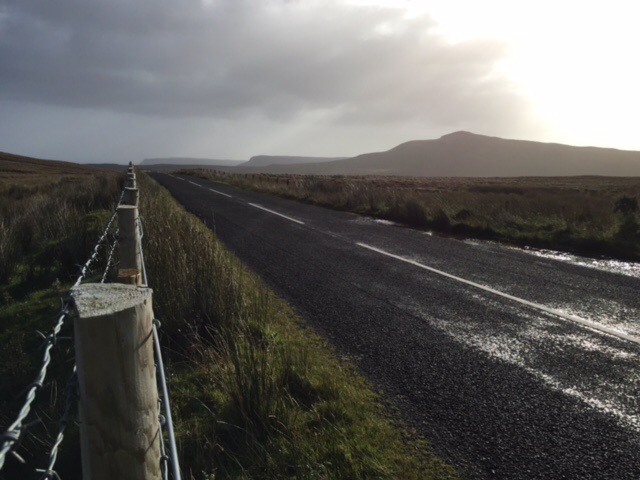 Then over the bridge and… wave bye-bye to Achill,” he laughs and smiles. He is called for dinner. We say goodbye and instead of shaking my hand he laughs and says, “I’ll give you a big Achill hug,” and so I hug him back and he laughs again and waves goodbye and goes to have his dinner of chips and curry. 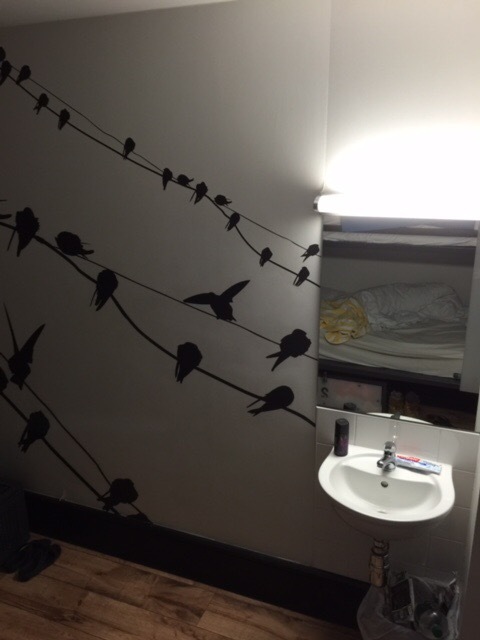 Generator Hostel on Haymarket in Dublin, Ireland. I am sitting at a long table with sunshine splashing over my fingers and a steaming Americano. An espresso machine hisses in the back. Miscellaneous conversations blend together. The young man opposite me eats a muffin and Skypes in German. 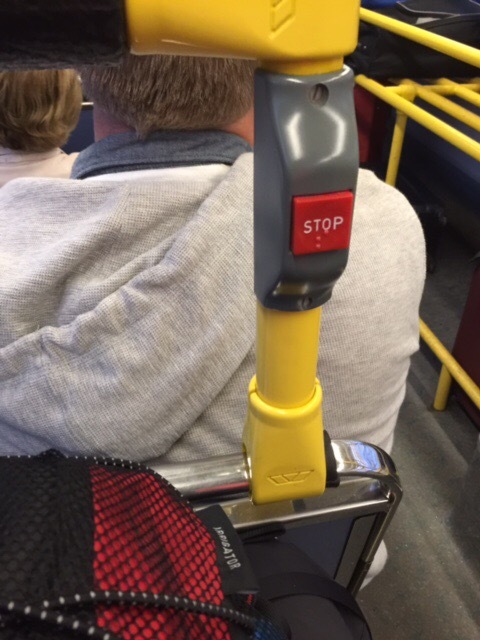 The older man to my right reads a newspaper with earphones in his ears. Feist plays Mushaboom. Whisky oatmeal is delicious. Every person I’ve talked to here smiles at me from the inside. 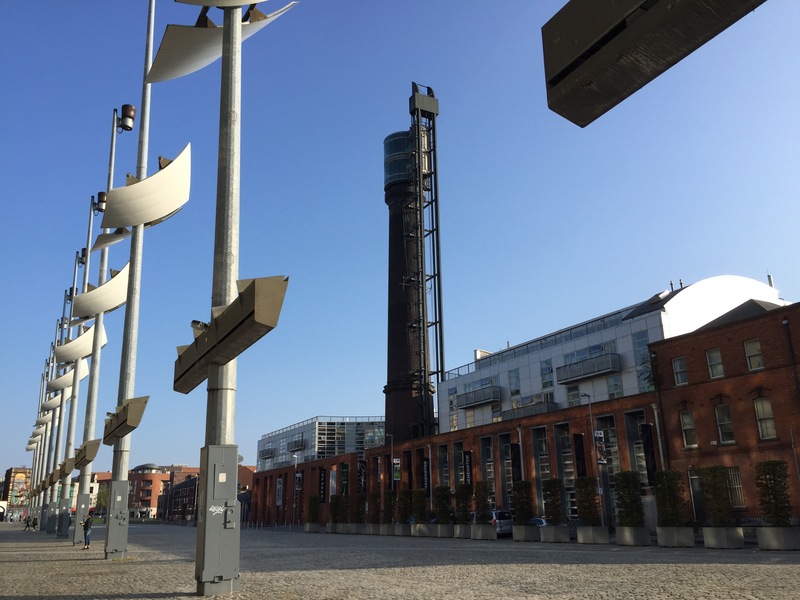 It’s the kind of place you want to be on a Sunday morning in Dublin. It’s why I’ve been back three mornings in a row. 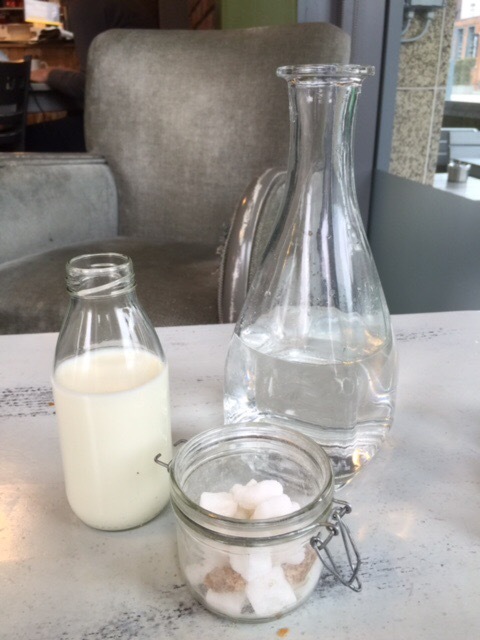 Breakfast table at The Third Space. I’m sad to leave this fun-loving city. But like all fun-loving places, it is best enjoyed with company. Elbowing your way to the bar for a pint between rafts of 20-somethings and groups of friends is one thing. Trying to drink it and not feel creepy while people watching is an art I’ve yet to master. I cannot complain. Dublin has been exceptionally kind to me. I’ve had sunshine every day. I met two lovely people at the laundromat. I had a full day yesterday of Irish history, political and pop culture. But travelling alone makes me introspective. Maybe that’s just how it is for everyone. I look at other people hanging out on their own and I wonder what their story is. My first day in town I met a Brasilian man in his 60s travelling England, Scotland and Ireland for a couple of months. He was keen to practice his English. A brave effort for anyone, let alone a man in his 60s so far from home. He told me he was from an island called Florianopolis and invited me to Brasil to meet his wife and family. We found our respective homes on an iPhone map, marvelling at the distance between them while, we sat shoulder to shoulder ourselves, peering at the tiny screen in a laundromat in Dublin. I stared, astonished at the kind of love they must have. For her to find happiness in his happiness, even if it means shouldering the burden of a young family alone. I tried not to imagine she had someone on the side. “You have a wonderful wife,” I told him. He smiled the smile of a grateful man and laughed and nodded with affection in his eyes. And then there was Brian, from Chico, California. He’d been on the road for seven weeks in Poland, the Czech Republic and mostly other eastern European countries. He was looking for a barber and throwing in a load of clothes, contemplating if it was time to buy a plane ticket home. He wondered what would happen if he taught English in a place like that. Whether he could influence young people, not by teaching some kind of American version of “truth” but just by being an example of a different sort of human being. I felt for him. We are all looking for something, out here on the street, in the laudromat, at the hostel. Connection. Adventure. Experience. Answers. Today, when I left the hostel room with its five still sleeping bodies, creeping out with my luggage, I asked the universe to help those people find what they were looking for. A job. Health. Love. Answers. Whatever it is. I hope they find it. For now, I’m off to find a post office.